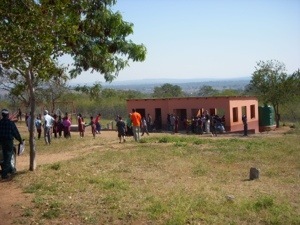 The seed that was planted by our Lord in Njojane, watered by Connection Point, One Child Matters, Children’s Cup and Fellowship Christian Church of Swaziland has grown into a young life-giving Care Point and Church. It sits high on a hill overlooking many of the homesteads that it serves and from the valley is truly a beacon of Light and Life that can be seen for miles. Tonight we prayed and ask you to pray for this community and the Church we have planted there. It is young and growing. It is like a small child that has needs for it to continue to grow in sharing the Good News of Jesus with the community it serves. Pray for the the elders of the community, the bomake, staff, and pastors that watch over and care for the people and facility. Pray that an Pastor will be identified to live on site and will speak the God’s Word to the people of the area and that it fall on fertile soil. Pray that funds for a preschool building can be raised to house the children who come there to have a safe place during the day, get a meal and begin learning about their Lord and Savior. Pray for more sponsors of needy children at our Care Point. God’s presence can be felt in this place and is at work. We pray for continued support, workers, love and nurturing so more will come to know Jesus as Lord and be fed spiritually and physically.